As Mark Gatiss acutely acknowledges in this month's Doctor Who Magazine, the Paternoster Gang of Silurian detective Madame Vastra, her 'companion' Jenny Flint and their Sontaran butler Strax are the new era's equivalent of Jago and Litefoot from classic series favourite The Talons of Weng-Chiang. Even though there was some discussion back in 1977 about giving the two Victorian characters their own spin-off drama we had to wait until 2009 and Big Finish's The Mahogany Murderers before we saw them as lead characters in their own milieu. If The Mahogany Murderers was the pilot for what has now become an enduring Jago and Litefoot audio series, then surely Gatiss's The Crimson Horror will intensify the clamour for a Paternoster Gang spin-off proper? It's certainly the feeling you get when the Doctor only makes his entrance about 15 minutes into the episode and after the first quarter of an hour is completely and satisfyingly owned by Vastra, Jenny and Strax. Gatiss returns to his The League of Gentlemen roots - diabolical goings-on up North - and weaves in the archness of his 'Lucifer Box' novels, the gaslight ghastliness of The Unquiet Dead and more than a passing acquaintance with classic horror cinema. It's Yorkshire, 1893 and there's a 'dark and queer business' going on at Sweetville, the factory and lodgings overseen by the domineering and pious matriarch Winifred Gillyflower (Dame Diana Rigg) and, when Mr Thursday (Brendan Patricks) arrives to investigate his brother Edmund's death, the tone of the episode - one positively drowning in 'the deplorable excesses of the penny dreadful' - is immediately established. Penny dreadful is the appropriate appellation for the Paternoster Gang's investigation of the Crimson Horror, wherein Sexton Blake meets Sweeney Todd as bright red corpses yield their secrets through optograms of the last image retained in a dead man's eye. 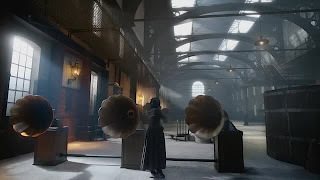 After he takes his concerns to the veiled Vastra in her Victorian hothouse Mr Thursday, clearly no slouch as a detective himself, is shown in a rapid montage acquiring the evidence from the corpse in the morgue, one that prefigures the use of early photography and cinema in a central sequence later in the episode. The sequence borrows from the same assertion made in, I suspect, one of Gatiss's guilty pleasures, Eugenio Martin's Horror Express (1972), wherein those gentlemen of horror Cushing and Lee examine an ancient creature's eye and find an image of the Earth seen from space in the retinal fluid, thus confirming it is an extraterrestrial. 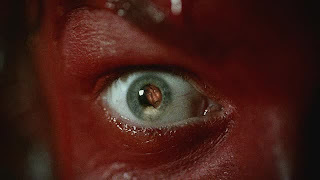 The idea, via Jules Verne, Lovecraft and Villiers de l’Isle-Adam, conjures up all kinds of associations with the folkloric 'evil eye' and the optogram is but one in an arsenal of Victorian technologies which the story associates with vision. Like the Gothic literature they accompanied, these tools of the sciences reveal and categorise the subject's internal anxieties and proximate an analogy between camera and eye. When it is revealed Edmund clapped eyes on the Time Lord before his ruddy demise, it's also a clever way of introducing the Doctor without him being physically present, offering a genuine reason to bring the Gang into the mystery. There's a brief homage to The Elephant Man (1980) as Mrs Gillyflower reveals the effects of such immoral progress on her daughter Ada, screened out of sight but then displayed, apparently 'blinded in a drunken rage' by her late husband, as a lesson for all to see. Ada's blindness, 'her beautiful eyes as pale and white as mistletoe berries' continues the motifs of vision and sight concealing and revealing truth in the story. We learn later she is, in fact, a victim of the horrible process inflicted upon her by her own mother and silent partner 'Mr Sweet'. Also note the red orbs of the portholes in the factory as a visual equivalent to this danger. Her blindness is not only physical but spiritual and moral too. She literally turns a blind eye until the final act, a sympathetic creature of impurity who sees a life with her monster in Jerusalem denied to her and has no compunction in snuffing out the parasite who caused her this disability. Mrs Gillyflower entreats her audience to join them in Sweetville, its factory and cottages depicted as 'the shining city on the 'ill', and appropriately encourages a chorus of 'Jerusalem', capturing something of the impetus behind the period's reforms in industrial and social conditions which came from evangelical Christians, who felt they had a moral duty to do so as private or individual philanthropists rather than rely on government action. However, she has a bonkers notion of surviving the so called apocalypse lurking beneath the bright lights of Bradford and Jenny sets out to infiltrate Sweetville to uncover the Doctor's fate. 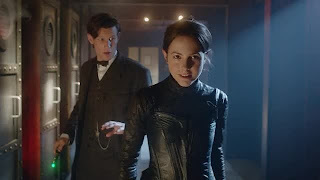 To do this she must, according to Vastra, 'ignore all keep out signs, go through every locked door and run towards any form of danger that presents itself.' Business as usual for the Paternoster Gang and lessons learned from the Doctor himself. Ada already has an affinity for the Doctor as, like her, he's been physically affected by Mrs Gillyflower's factory process. Her love for her 'dear monster' echoes the notion in Hide that 'every lonely monster needs a companion' as well as offering an analogy to the various monsters Frankenstein forever locked away in their cells. These are signs of impurity hidden away in Mrs Gillyflower's drive to recruit only the best for Sweetville where even your teeth can let you down in a factory that's not really a factory. Saul Metzstein's imagery of a vast, empty factory floor filled with the sound of industry from a row of phonograph-horned speakers is uncanny and ghostly. The whole is also sweetened by lovely little performances from the supporting cast. The morgue attendant is a wonderful grotesque with a greasy turn of phrase. 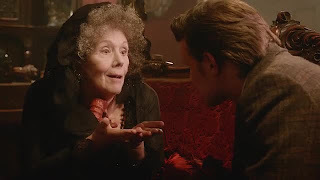 'I've pickled things in 'ere that would fair turn yer hair snowy as top of Buckden Pike,' he offers to Vastra when she comes calling about the various victims of the Crimson Horror. Dame Diana and her daughter Rachael are obviously lapping up the opportunity to work together on such phantasmagoria, evident in the scene where they have a meal together and the absence of 'Mr Sweet' is noted between slurping of soup and upsetting of salt cellars. That said, this is merely an understated moment in a set of performances which get riper by the minute and, by the devastating conclusion, becomes a hyperbolic Grand Guignol of Victorian family and public life depicted as circus. 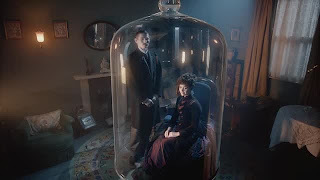 When the Doctor does eventually show up, rescued just when he thinks his 'favourite Victorian lock picking chamber maid will never turn up', his own crimson horror owes a nod to the incarcerated Frankenstein monster and there's a touch of Karloff in Matt Smith's performance as he lurches toward Jenny framed in the doorway of his cell and she escorts him off the premises. It's also darkly funny as the mute, creaking, solidified Doctor, clad only in a pair of long johns, lurches down the corridors as Ada arrives to check on her prize and finds her monster has fled. Funnier still is the genre mash-up as, in passing, Jenny and he discover the demented purpose of the factory. Mystery of the Wax Museum (1933) and its remake House of Wax (1953), wherein Lionel Atwill and Vincent Price - take your pick - plunge their victims into vats of wax collides with the shenanigans of Kenneth Williams' Dr Watt in Carry on Screaming (1966) as we see the chosen ones taking a dip. 'Frying tonight!' would be an entirely appropriate thing to say during that scene. 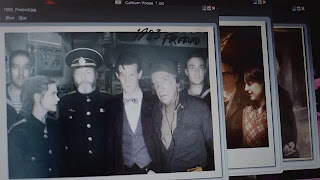 Half way into the episode, a rather bravura sequence appears in which the Doctor recounts how he and Clara came to be prisoners of Sweetville. Once again, we have an analogy to the technical advances of the time and the whole back story plays as a sepia tinted early film, with crackling soundtrack, jumping frames and dust and scratches seemingly part of the Doctor's recall. It bowls along and seems to allow the viewer a voyeuristic role within the Doctor's recent memory, mixing our gaze with the iris of the camera and his narration, using still images truncated by shutters, point of view from a corpse in a morgue and Edmund Thursday as a expositional figure brought back from the dead. 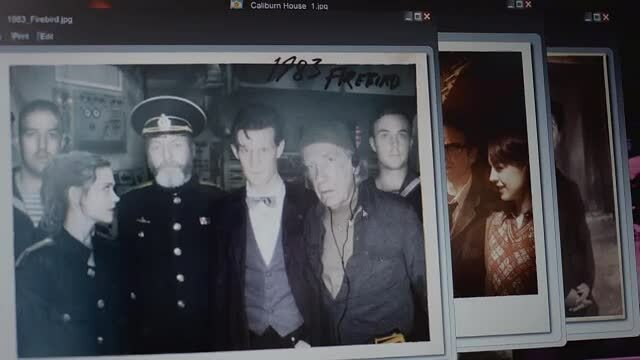 It's a highly self referencing moment - alluding to early cinema and photography - and an ambiguous use of nostalgia that replays memory within the ongoing narrative, as the Doctor and Clara pose as Mr and Mrs Smith to get the measure of Sweetville. Yet, it even has time to reference Tegan's grump about not ever getting back to Heathrow coupled with a 'Brave heart, Clara' to complete the postmodern Gothic effect. To cap it all, there's even a barrel organ on the soundtrack. 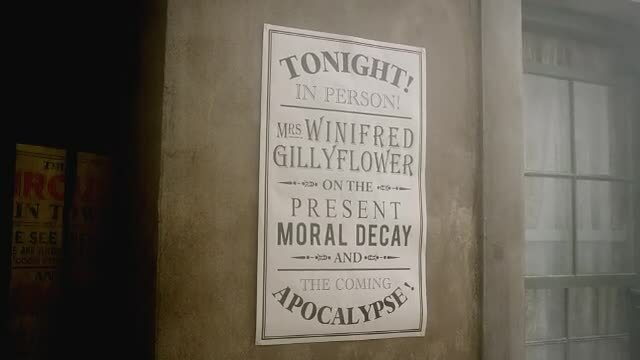 It may be a frankly illogical plot on behalf of Mrs Gillyflower, but it is deliciously mad and crammed with lovely character moments for Jenny, Vastra and Strax, many quotable lines and a pretty terrible joke featuring a young urchin who gives directions to Strax and is christened Thomas Thomas. 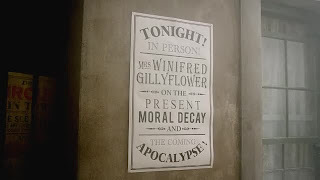 When Ada breaks down and admits she has had a 'sentimental attachment' to the Doctor, her terrible mother simply barks 'kindly do not claw and slobber at my crinoline' and banishes her back into the darkness where, in Gillyflower's philosophy, all imperfect creatures belong. And that Jenny provides an homage to a certain leather-clad Avengers girl is surely no coincidence in a story whose guest star once threw burly stuntmen around the studios of ABC television in the 1960s. Hang on. Did I say it was deliciously mad? How about insanely, steam punkily mad when it is revealed that Mrs Gillyflower has a Red Leech attached to her breast and it is prompting her to construct a rocket which will rain down its poisonous venom onto Yorkshire when she launches it from her disguised church organ. The stand off, when it comes, is clearly enjoyed to the max by Rigg and her daughter Rachael. When the Doctor points out that in the wrong hands the leech's toxin will wipe out humanity, Rigg has an impish twinkle in her eye when she says with glee, holding out her hands, 'D'you know what these are? The wrong hands!' Like any megalomaniac, Mrs Gillyflower is, of course, hoist by her own petard. 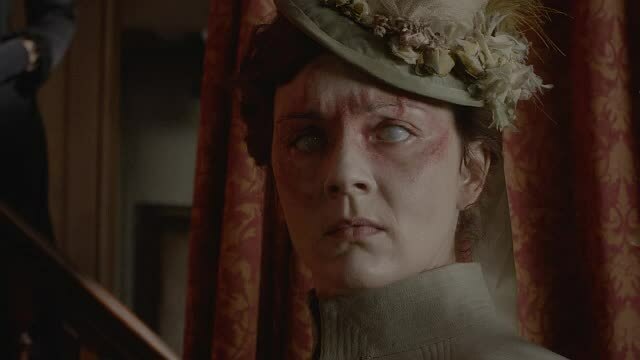 In this case, it's her tortured daughter Ada who, upon hearing the truth, takes her walking cane to her own mother. You might want to agree with Ada when Mrs G pulls a gun on her estranged offspring and the girl pleads, 'Please, mama, no more, no more' but more is what you get as (over) wrought iron rockets blaze into the sky, Mrs G takes a tumble after Strax turns sniper and Ada viciously puts an end to 'Mr Sweet' as he crawls away from her mother's dead body. Saul Metzstein once again shows his directorial mettle and aesthetic empathy with Victoriana, making The Crimson Horror one of the handsomest episodes in the current run. The Doctor and Clara take something of a back seat to the proceedings, with particularly the latter getting the least to do in the episode. 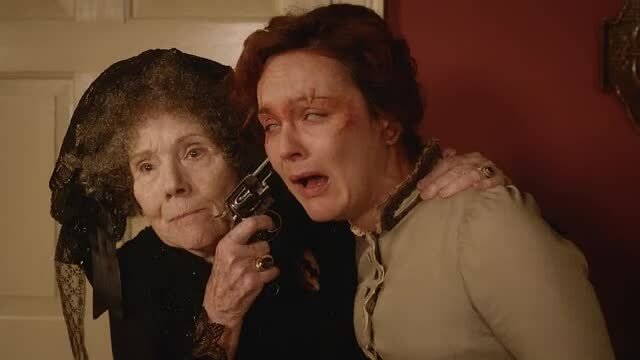 Instead, the scenery-chewing mother and daughter combination of Diana Rigg and Rachael Stirling dominates, often eclipsing the welcome return of the Paternoster Gang. If you're familiar with Gatiss's work beyond Doctor Who and enjoy a horror pastiche with its tongue firmly in both cheeks at once then your appetite will truly be sated. A vibrant, lively episode for sure. And the return to contemporary London, where Clara's charges Artie and Angie Maitland have somehow been able to track photographs of Clara's trips through history, is a bit of a head-scratcher. 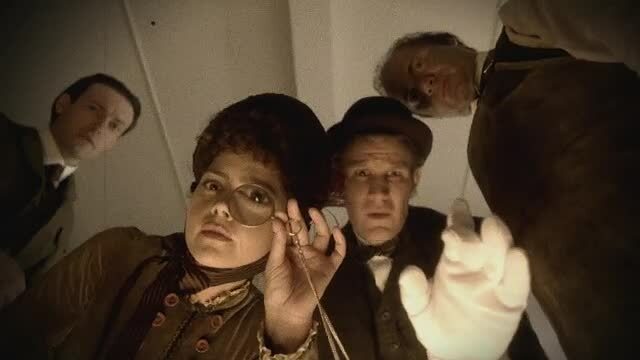 I for one want to know who was snapping away merrily in 1983, 1974 and in Victorian London and why John and Gillian have suddenly popped up to join the TARDIS crew again. How could anyone not love this episode! Everything I love crammed into forty-five minutes. And yet I've just listened to a podcast review where one of the contributors hated it because it was “bland”?! BLAND?? What the heck was he watching! LOL! Superlative analysis as ever, Frank -- I’ve learned something new from reading each one of them this series. Bland? 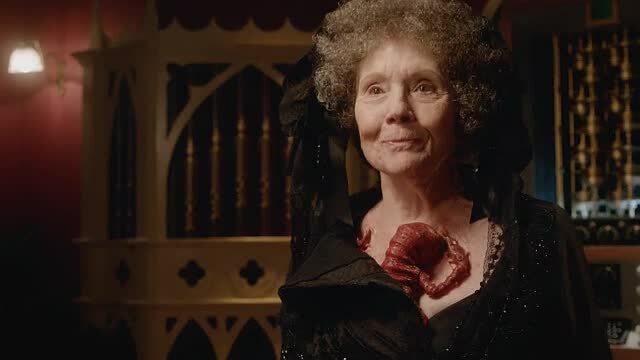 'The Crimson Horror' might be accused of many things but BLAND?! It was certainly one of the best episodes in this series so far, along with 'Hide'. And Gatiss's best script to date. Don't know what your podcaster was watching! Not bland, just rushed. Breakneck. Crammed, as Black Gloves said, into 45 minutes when what it wanted was 90 to build a bit of tension and a bit of genuine thrill. What we got as a four-donught sugar rush which disappeared all too quickly leaving me to kick around little issues like gramophones not working that way no matter how big you make the trumpet, Jerusalem not getting put to music until at least 4 years after the story was set and wondering what that rocket was powered by since you could survive standing inadvisably close to the launch. But never mind. The cast gave such good value for money that I can't really complain.